Chef Fredrik Björlin of Vassa Eggen Restaurant in Stockholm, Sweden gets ready for the 2008 International Culinary Olympics and shares his vision and recipes for a creative 3-course menu. While I was in Stockholm in May 2008, I had a wonderful dinner at the attractive Vassa Eggen Restaurant where I met with Chef Fredrik Björlin to learn more about this interesting chef. For starters, he grew up appreciating good food, and although his mother is a teacher, and his father works in a bank, they both like to cook and passed their culinary passion on to their son. He has been at Vassa Eggen Restaurant for 8 years now, beginning as a student, and has worked at all of the stations honing his skills. When I asked him about culinary trends in Stockholm, he replied that it is more of a lifestyle now, with an emphasis on ecological, smaller farms producing meats, vegetables, and produce. Stockholm (population +1.9 million) is booming with new restaurants and he described the restaurant scene as having many restaurants and few "eaters", but there is a good brotherhood of chefs here. When not working at Vassa Eggen Restaurant, his spends time with his girlfriend, snowboarding in the winter, and preparing with the Swedish Culinary Team for the 2008 International Culinary Olympics that will be held in Erfurt, Germany from October 19 - 22, 2008. The team consists of 13 chefs who have worked together for the last 3 years. 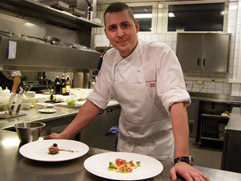 No stranger to the competition, Chef Fredrik Björlin competed as a Junior in the last Culinary Olympics held in 2004. Luxury Experience Magazine wishes Chef Fredrik Björlin and the team much success at the 2008 International Culinary Olympics. As for the menu at Vassa Eggen Restaurant, I look forward to returning to Stockholm and sampling more of Chef Björlin's creative recipes. 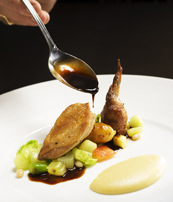 His 3-course menu provides an insight into his culinary vision. Method: Mix all ingredients with salt and white pepper to a smooth mince. It is important to keep everything well chilled. Season with cognac and port wine. Bake in a bread pan at 85 °C (185 °F) until inner temperature reaches 75 °C (167 °F). Let rest overnight to settle. Method: Boil all ingredients and adjust with vinegar. Spread into thin sheets on baking trays. Serve with croutons of dark rye bread, fresh plums, and a little plum chutney and salad. Method: Sauté onions and garlic in butter until clear, add polenta and cover with milk and cream. Gently simmer over low heat and mix to a smooth cream. De-bone chicken and make a dark stock of the remains. Reduce to a sauce and season with vinegar and salt. Sear chicken quickly in a frying pan and bake in the oven until done. Method: Blanch celery and zucchini quickly. Just before serving, heat all vegetables in olive oil and season with salt. Method: Beat egg, yolk, and sugar syrup in a Bain Marie until it reaches 86 °C (187 °F). Then beat with an electric mixer until it reaches room temperature. Fold in some of the cream into the chocolate. Mix the chocolate and the egg, and then fold in the cream. Fill cylinders with the chocolate mousse. Method: Mix all ingredients and heat gently in a saucepan until sugar and gelatin are dissolved. Cool and process in an ice-cream machine. Method: Heat gently to 60 °C (140 °F), let rest for 10 minutes, and then strain it. Foam with stick blender at serving time. Method: Mix ingredients and let rest to marinate. At serving time, pipe sorbet onto a frozen tray and cut into cylinders. Keep in mind that the chocolate mousse is to be served at room temperature. Read other articles on Vassa Eggen in the Restaurants and Destinations sections, and also in Swedish in Chefs' Recipes section.